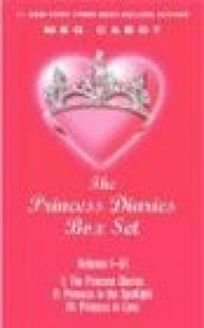 The highly popular saga of an ordinary-girl-turned-princess is dressed up in a hot pink boxed set of paperbacks, The Princess Diaries: Volumes I-III by Meg Cabot. In The Princess Diaries, Manhattan high-school student Mia Thermopolis finds out-to her dismay-that's she's actually a princess, next in line for the throne of a small European country. In Princess in the Spotlight and Princess in Love, Mia gets caught up in royal turmoil and boyfriend troubles.